Breadsticklers - A Leeds Food Blog: Cosy up at the Adelphi with their new winter menu. The Adelphi has seen this part of the city change over the many years it has stood here. It's neighbours have changed from mills, factories, warehouses and poverty stricken back to back housing to estate agents, city centre apartments and flattened sites. Flattened sites which sadly include the original Tetley Brewery, a piece of Leeds' history that its now owners took from the city and demolished along with its first ever pub. The workers of Tetley's would descend on the Adelphi to sample the fruits of their labour, retiring at the end of the day to a place which would be luxurious in comparison to their own homes. Sitting in 'smoking room 2' I felt like a cast member of Peaky Blinders, with it's wooden windows with iced glass panes, open fire and traditional lamps. It's like being transported to another century. 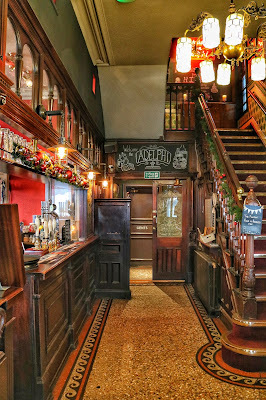 The word 'Adelphi' comes from the Greek/Latin meaning sibling or brothers, whether it just symbolises the brotherhoods that frequented here often or it was a sibling of another chain of public houses I'm not sure. I'd love to more about its history if anyone has anything more to offer? 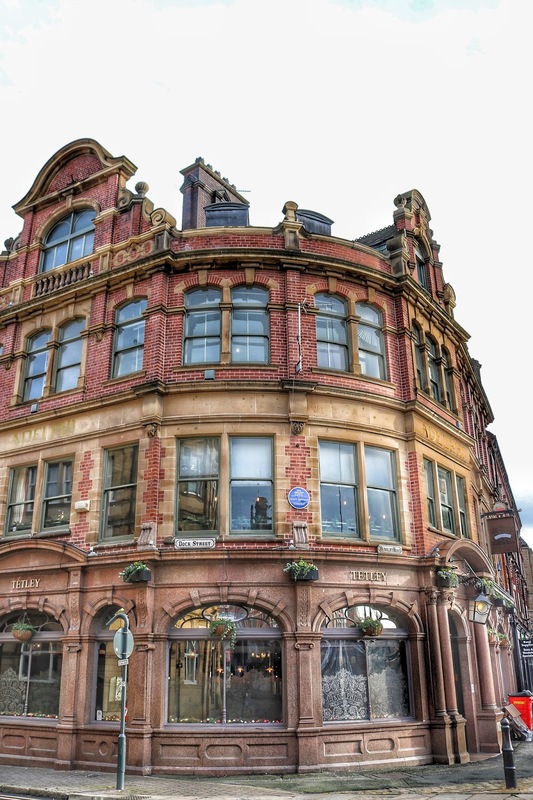 The Adelphi is slightly out of Leeds' city centre, so it can be relied upon to be fairly quiet in comparison to some of the pubs, bars and restaurants that fall along the main crawl. We escaped one Saturday lunch time from the Christmas shoppers to sample their new winter menu. 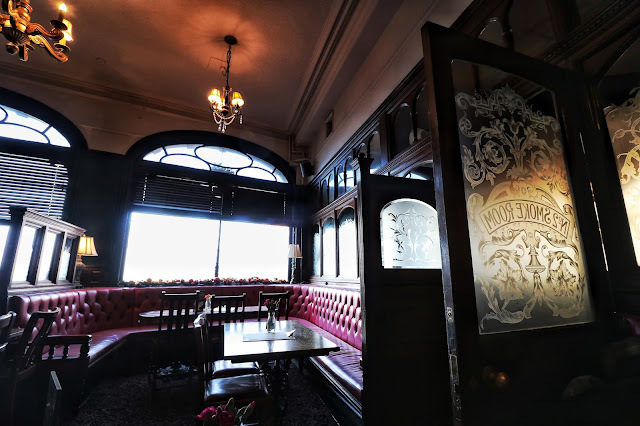 With classic pub food options like fish and chips, burgers, sausage and mash and a good old Sunday lunch you know it's a place you can settle down and have a lazy lunch and be comforted in the warmth. This is no ordinary pub lunch. You won't find plain burgers and chips here, you'll find a handmade bacon and beef burger in a brioche bun with a gherkin and fries. The sausage and mash are Cherry Orchard Farm sausages, spring onion mash, crispy onions and red wine jus (gravy). How lush does that sound! Feeling the bite of the cold and a little festive spirit the rosemary and garlic baked Camembert served with warm sourdough and celery was too hard not to resist. D and I devoured it all, except the celery (ha!) and it gave me a great idea for our traditional Christmas eve supper of baked Camembert and pigs in blankets... add garlic and rosemary to the cheese. This Christmas is going to be the greatest ever (in food terms). For mains I went for something a little bit different, something you wouldn't find in your run of the mill chain pub, the guinea fowl. The guinea fowl is breast stuffed with spinach and pecorino served with roasted butternut squash and tenderstem broccoli. I was tempted to order a side too but glad I didn't as the cheese starter and the vegetable side servings were more than enough. The guinea fowl was cooked to perfection and the sides complemented it well, I haven't had roasted butternut squash for a long time so it was a nice treat (because how hard is it to cut a butternut squash at home!). The gravy was on point and I could have licked my plate clean. 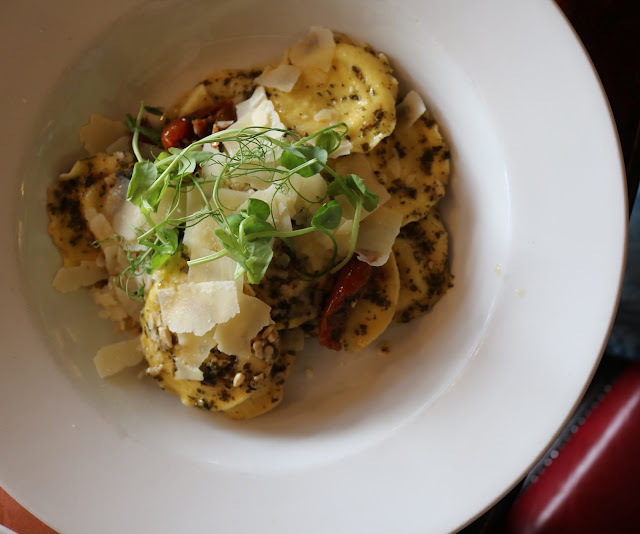 D chose the burrata ravioli with marinated tomatoes and herb dressing topped with shaved cheese. I love burrata and very rarely have it cooked, I tried a bit of D's and it was simply divine. I'd expect to eat this standard of pasta dish in a highly rated Italian restaurant, hats off to the chef. Too full for dessert we gently supped our pints of doom, an amber ale which agreed with me greatly (hurrah I can drink beer again as long as it's amber and pulled from a cask, rather than drank from a can). Service was friendly and warm, there was a relaxed feel and a slow coming and going of customers that made the place feel warm. I expect the atmosphere may change a little in the evening but I'd still come for a drink or two and stare at those gorgeous Victorian tiles for a little longer.